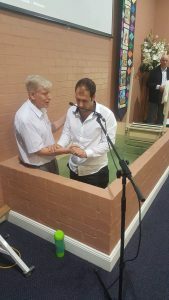 We hold baptisms after the main morning service every one or two months. If you have been saved but have not yet been baptised by immersion, or for more information, please speak to Pastor Keith Piper or Michael Germi. Baptism by immersion in water pictures the Gospel of Christ’s death, burial and resurrection that I am trusting in to pay for my sins, as I go in under and come up out of the water. Baptism pictures death to my old way of life, burial of my old nature and habits, and rising to a new life with Christ. The right motives for baptism are to obey Christ’s command, follow His example and publicly testify to our personal faith in Christ.